DARPA’s doing more than working on robots and super soldiers. It’s also developing the biggest space telescope in history, with the hopes of launching it to join the majority of communications satellites in geosynchronous Earth orbit in the Clarke belt, about 22,000 miles above Earth’s surface. 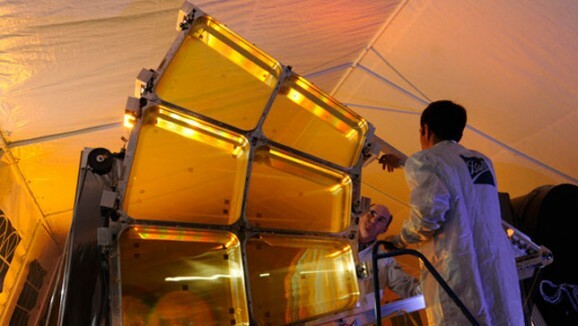 The MOIRA (Membrane Optical Imager for Real-Time Exploitation) telescope is being designed with something called membrane optics, which allow for higher resolution magnification, lighter weight, cheaper launches, and fewer deployment challenges. Membrane optics are a cutting-edge field in telescope lens development, and the main difference between them and conventional lenses is that membrane optics use diffraction, rather than the more conventional reflection or refraction. Reflection is the easiest to understand, as we have more daily experience with this. Reflection changes the direction of waves by inserting some kind of barrier, such as a mirror. Refraction involves changing the direction of waves not with a barrier, but with a change in medium that bends the waves, changing their wavelength and speed. Diffraction changes the direction of waves by passing them through an opening or around a barrier. Generally, reflecting and refracting lenses are made of mirrors or glass, while the lenses being used here by DARPA are made of flat plastic lenses called Fresnel lenses, which is the same kind of lens used in most lighthouses because it captures more oblique light. Each membrane will have such a lens, and each lens will have circular grooves etched into it, sort of like a record does, except far, far smaller, especially toward the outer edge of the lens. The pattern directs light on a sensor that the telescope then converts into an image. While there are advantages to membrane optics and DARPA’s design, the light transmission efficiency of glass is much higher than that of membranes — about 90% vs. 30-55%. But for DARPA, it’s a good trade, as the material swap reduces the weight of the telescope by about 86% over traditional designs. The membranes are made of lightweight polymer, and they’re shaped like flower petals. For the ride to space, they’d be folded in so the entire telescope could fit on a rocket, but once in orbit those membrane petals would unfold. The diameter of MOIRA will be eight times that of the Hubble and three times that of NASA’s James Webb telescope, which is scheduled for a 2018 launch. DARPA began work on MOIRA in 2010 and is currently in Phase II of the project. It expects to develop a 16-foot prototype of the mirror soon for ground testing.